The Rio Grande is the fourth longest river in the United States with an approximate length of 1,896 miles. It flows from Colorado to the Gulf of Mexico. It is one of the principal rivers in the southwest United States and northern Mexico. The water shed of the river is approximately 335,000 square miles. It forms the international border between Mexico and the United States. Its major tributaries include the Pecos, Devils, Chama, and Puerco rivers in the United States, and the Conchos, Salado, and San Juan in Mexico. 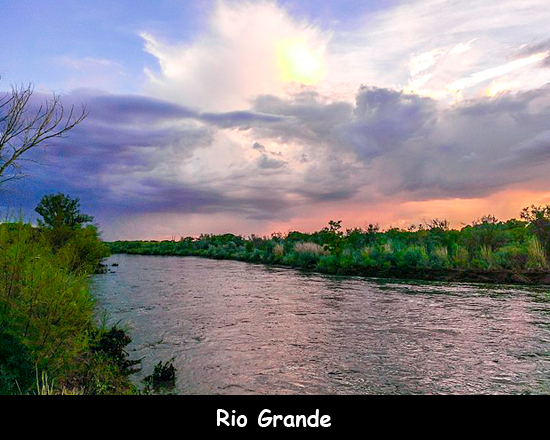 The name Rio Grande has been derived from Spanish and it means ‘Great River’. This name appeared for the first time on a map of 1536 compiled by a royal Spanish cartographer. There are canyons created by the flow of water. During the 1800s, steamboats were used for transportation of military personnel in the Mexican War. It flows through seven states, three of them are U.S. states and four are Mexican. Those states are Colorado, New Mexico, Texas, Chihuahua, Coahuila, Nuevo León and Tamaulipas. There are a number of dams built along the river including the Rio Grande Dam, Cochiti Dam, Elephant Butte Dam, Caballo Dam, Amistad Dam, and Retamal Dam. The average discharge of this river is 68 cubic meters per second. Both countries, the United States and Mexico signed a treaty about the river in 1944. In 1997, it was designated as one of the American Heritage Rivers by the United States. Declan, Tobin. " Facts for Kids about Rio Grande ." Easy Science for Kids, Apr 2019. Web. 24 Apr 2019. < https://easyscienceforkids.com/rio-grande/ >.